Washington, DC – If you think your feet hurt after a long day spent atop them… imagine weighing 9,000 pounds. That’s the situation that Shanthi, a 41-year-old Asian elephant at the National Zoo, finds herself in. Shanthi suffers from arthritis, which can make getting around painful. It’s also led to problems in her front feet, including cracks in her toenails and lesions on her skin. Actually, they’re more like boots, custom made for Shanthi in about a size 20, with an EEEEEEEEEEEE width. Sitting on a table in a staff room in the zoo’s Elephant Community Center recently, a single boot resembled a rubberized birdbath. Elephants have five toenails on their front feet and four (usually) on their back feet. An elephant foot can be close to 20 inches across when it’s resting on the ground, six inches smaller when it’s lifted up and the weight is off it. That foot care includes regular inspections, pedicures and occasional X-rays. Shanthi’s arthritis has caused her to lean forward on her feet, stressing them. Zoo veterinarians needed to treat the arthritis with injections and apply topical treatments to Shanthi’s troubled nails and skin. They also needed to keep debris out of the fissures in her feet. This all posed a challenge, especially keeping the medication on long enough to work. Elephants are intelligent and curious, with dexterous trunks well-suited for unwrapping bandages. Boots had been used successfully at other zoos, so the National Zoo decided to give them a try. There is no Brannock device for elephants, that metal contraption humans step in to measure the length and width of their footsies. Instead, the Smithsonian’s 3-D Digitization Program produced scans of her feet that were sent to Teva in California. The footwear company already had experience with interesting custom jobs. It made a pair of elephant shoes in 2004 and in 2011 created a tiny sandal for the Santa Barbara Zoo, where a Humboldt penguin named Lucky had an impaired foot. Chris flew to China to oversee construction of the shoes, which Teva donated to the zoo gratis. What does Shanthi think of wearing shoes? Now Shanthi takes the boots in stride. The arthritis treatment seems to be working. The swelling in her left foot has eased. Keepers have to stuff some foam in the boot to make it fit — elephant orthotics — and Shanthi is more mobile and unafraid to amble down the steep incline into the pools, where she plays and rolls around. “We’ve given her a good quality of life and improved her level of comfort,” said Don Neiffer, the National Zoo’s chief veterinarian. On a recent afternoon, Deborah the elephant keeper knelt at Shanthi’s feet, separated from the elephant by widely-spaced bars. The world’s largest land mammal can be dangerous, after all. “If she stood a foot away, I wouldn’t be able to do it,” Deborah said. But Shanthi was standing up close, encouraged by Deborah’s calm patter and light touch — and by the apple-flavored fiber biscuits Deborah offered. At just the tap of Deborah’s finger on a gnarled gray toe, Shanthi lifted her left foot. Deborah slid a boot under it, and Shanthi stepped down. 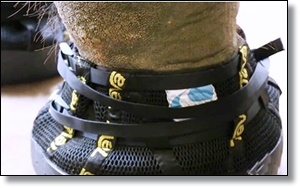 She sealed the Velcro closure, cinched the webbing at Shanthi’s ankle and then said “Over,” asking the elephant to rotate 180 degrees and present her right foot. This Shanthi did, pausing only to lazily grab some hay with her trunk. Shanthi lifted her right foot, then, like Cinderella after the ball, gingerly stepped into the boot. I’ve seen parents have more trouble getting their squirming toddler into a pair of sneakers.